There comes a time in every kid’s life when they have to make a choice, a choice that may have a lasting affect on their mental and physical wellbeing. We’re talking, of course, about choosing “their” sport. Whether your tot is excited to play soccer or your middle schooler wants to run track, you want to support them in making healthy decisions. While the typical team sports have great benefits, it’s worth considering an alternative route that can literally last a lifetime. No one can predict what a child’s true passion will be, but we think it’s a great idea to introduce children to the sport of cycling, and the earlier the better. Children who begin biking or walking to school by the first grade are more likely to stay a healthy weight during their early school years, and kids who participate in bicycling more than four times a week are 48% less likely to be overweight as adults. Big numbers when you consider that two-thirds of adults are overweight or obese. Worried about safety? A child who rides with friends or adults wearing helmets is more likely to wear one themselves, so be sure to get your child in the habit while they’re still at the ride-along stage. Protected bike lanes and paths are proven to be safer routes for cyclists. Take caution by teaching the young ones the safest course for their two-wheeled travel around your home. Here are the top six reasons why cycling is a fantastic choice for kids. Once you learn how to ride a bike, the rest is simple. There is no dramatic learning curve, no need for expensive and intense summer camps. To ride, all you need is a bike and helmet. It’s been proven that regular physical activity promotes psychological well-being, so encourage your kids to get on a bike, and help them stay calm and focused for that next math test or book report. You don’t need a team, but you just might find one. Whether it’s a loose-knit group of like-minded cyclists or an official team with matching kits, cycling has the ability to bring people together. Some of junior’s best friends may be folks he meets on a bike. If you get the kids on the bike, chances are you’re joining in. 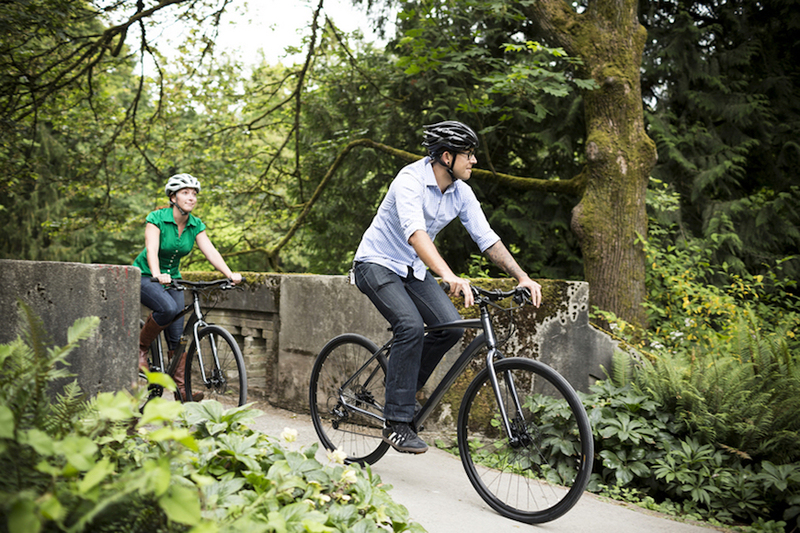 Bicycle commuting burns an average of 540 calories per hour. That means increased fitness, lower blood pressure, decreased stress, and, quite simply, fun. The beauty of cycling is its longevity. With low impact and stress on joints, the avid cyclist can pedal well into their senior years. Bikes can be fitted for all types of riders, and while it can be a group sport, it also allows for a go at your own pace ride, making it a fantastic choice for people of all ages and fitness levels. Biking is a fun and inexpensive way to help kids see the world in a whole new way. With a watchful eye, you can ensure your child stays safe and enjoys the multiple benefits of a lifelong love of cycling.